The Nature Trails of Great Smoky Mountains National Park are short and fairly easy trails developed by park rangers with the non-hiker in mind. They’re self-guiding, and some even have brochures that point out the many things to notice. Even though many of them are quite easy, and suitable for families with small children and the elderly, they all give a richly rewarding experience of nature, and present highlights of the rich diversity of the park’s natural abundance. The Nature Trails are generally no more than a mile long. Three of the Nature Trails are so easy that we include them in our guide to Easy Walks in the Smoky Mountains. 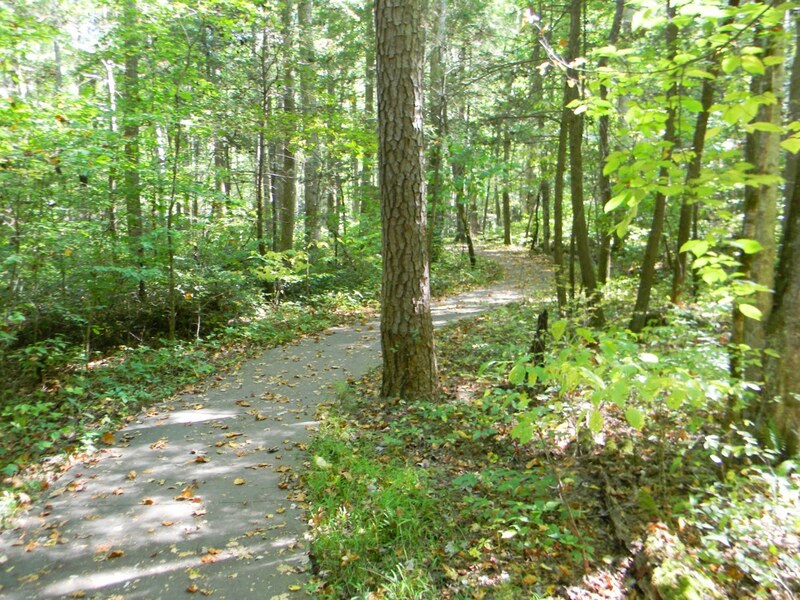 These are Fighting Creek Nature Trail, Elkmont Nature Trail and Sugarlands Valley Nature Trail – the easiest one of all, a flat and paved loop accessible for wheelchairs and baby strollers, set deep in nature. Here are some more Nature Trails you will want to know about. Sugarlands Valley Nature Trail – source unknown. This trail is 0.8 miles long and designated easy. As with almost everywhere in the park, there may be roots, rocks and river bank settings to deal with. The trail leads to an old log cabin and mill on the river – kids will have great fun on this trail – and it takes in fantastic wildflower displays in spring. There’s a brochure for 50 cents on the honor system. This can be bear country, so know how to act – see our guide to Black Bears & Wildlife in the Park. To get there, from Gatlinburg at traffic light #8 turn on Airport Road to Cherokee Orchard Road and find the parking area – 2.7 miles in all. This is a nature trail that many people think of as a scenic drive, because you can drive it. A magnificent achievement by the park service, this 5.5 mile loop road starts just a mile past the Bud Ogle Nature Trail. It offers two great scenic overlooks and a mountain crossing, it runs along a roaring creek, intersects trailheads, and provides numerous places to stop and explore. See our guide to Roaring Fork Motor Nature Trail. This drive closes in winter, while the other trails are typically open year round. Cades Cove is a great favorite to drive to, and this nature trail is a great way to get out of the car (and usually away from crowds) and take the family on an easy walk. It begins about 1 mile from the Visitor Center, from the loop road where you can park your car and pick up a brochure. It’s a loop trail itself, about 2 miles long, flat and easy, great for families. It’s very beautiful and has numerous trees, wild with blooms in the spring. This is one of the best wildflower trails in the park – in spring don’t miss it. It’s beautiful all year, however, and the fall colors are gorgeous too. It’s a short 0.9 mile loop through old-growth trees, rated moderate, not easy. It can get steep, and there can be some scrambling and stream crossings. It has a brochure available, and numbered points along the trail. Bring a camera! This trail starts at Chimneys Picnic Area, so you may want to factor in a meal here too. It’s 4.4 mi south of Sugarlands Visitor Center on Newfound Gap Road. This is another trail that starts from a picnic area. The Cosby end of the park, to the east, tends to be more quiet and less traveled. It’s also incredibly beautiful. The campground takes tents and RVs. Plan to visit the picnic area anyway, it’s a lovely place to gather with family and friends, or just quietly take a break. And don’t leave without giving yourself the pleasure of the nature trail. The Cosby Nature Trail is a 1-mile loop, easy and perfect for a family walk. It’s a winding path under shade trees and with footbridges across streams. In season it has lots of wildflowers, and it’s good for bird watching too. There’s a bit of magic happening on this trail. There’s a brochure, and it’s a great home-school field trip for the kids. The Cosby campground and picnic area is about 20 miles from Gatlinburg, a 3/4-hour drive. It can also be reached from Sevierville and I-40, bypassing Pigeon Forge and Gatlinburg. Both routes are beautiful drives. Check a map to find Cosby and the Cosby Entrance Road to the park, which leads to the campground area.This is bear country, be scrupulous with food and litter. This trail is only 1/3 of a mile long. It’s unique, traversing part of the southern Appalachian spruce-fir forest. The trail is not marked on the national park map, although it’s a park trail. You can find the trailhead in a small pullout off Clingmans Dome Road, 2.7 miles in from where you turn off Newfound Gap Road. If you’re going to Clingmans Dome anyway, and lots of people are, try this unique side-trip that no one knows about. It’s an easy hike, practically flat, amid thick evergreens and other trees, and with a diversity of wildflowers and wildlife. As you explore these showcase trails of the national park, you should also know about the Quiet Walkways. These are more hidden gems that park rangers have developed for their charm and the relative ease with which you can plunge deep into nature. The walkways are very short, usually less than a half mile, and they start right off the highway. See our guides to these: The Quiet Walkways of Great Smoky Mountains National Park and Quiet Walkways Along Busy Roads.